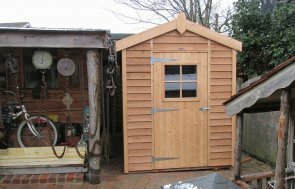 This 3.0 x 3.6m Superior Shed was installed for use as a storage and potting shed. Like all of our Garden Buildings, delivery and installation is included as part of our end to end service. The exterior features shiplap cladding, which was finished in our light oak preservative. This preserves the timber's natural look whilst warding off woodworm and fungi. The roof is lined with heavy duty felt to make it extra weather resistant. A security pack was added, which included window bars mortised into the frames, security screws and a seven-lever lock. The interior includes a workbench fitted along the gable end. The shed benefits from double doors to transport any large items in and out of the building with ease. 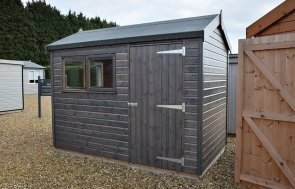 Our Superior Sheds are robust and ideal for secure storage, a hobby room or workshop. Available in a wide of range sizes, you can have a simple shed or we can tailor your building to include extra features such as electrics, lining and insulation and a security pack. Our years of bespoke construction means we can tailor luxury buildings to however you intend to use them. We want to provide our customers with the perfect space in their garden. For more information on our sheds, please use the link below.